Thanks to everyone who came out for the live Scott Bateman Animation Show in New York Thursday night. We had a full house, and we learned that the #1 problem with health care in America is Hilary Swank. 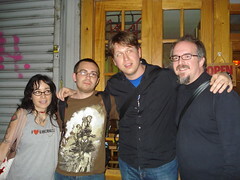 From left: Janeane Garofalo, Jamie Kilstein, Pete Holmes, myself. Tentatively, I think I’ll be doing the show again in mid-September with an all-new panel. Stay tuned. « New animation: Sarah Palin resigns!